FILE - A grizzly bear walks in a meadow in Yellowstone National Park, Wyoming. Summer is getting under way, and with it, the mass migration of vacationers and day visitors to America’s state and national parks. According to U.S. government figures, hundreds of millions of people visited these oases in 2015 alone. But research conducted at the University of Missouri’s School of Natural Sciences indicates that African Americans are significantly less likely than whites to sample the wonders of America’s parks. Previous studies have attributed this to cultural differences between whites and blacks. But that analysis doesn’t go deep enough, says UM professor Kanjae “Jerry” Lee, who oversaw the study, entitled Bourdieu and African Americans' Park Visitation: The Case of Cedar Hill State Park in Texas. For his research, Lee conducted in-depth interviews with 13 African Americans from Cedar Hill, Texas. Most were middle class, and lived near Cedar Hills State Park. 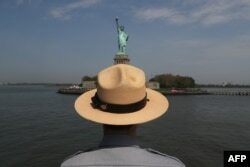 FILE - A U.S. park ranger looks towards the Statue of Liberty while in route to Ellis Island. But hesitancy among African Americans is not due solely to past abuse. Most interviewees said they had experienced racism from whites in their community today, and assumed that this poor treatment would “spill over” to treatment by whites at the park. Also, Cedar Hill State Park sits on the site of a former plantation, which was run by a family that owned African American slaves. This fact is ignored by park signage, which calls the place a “farm.” Lee reports that this de facto denial of the location’s dark history amounts to racism in the eyes of many blacks. Lee proposes several approaches that may help African Americans to view state and national parks as their own inheritance and joy, too. In addition, because state and national parks are managed and paid for with taxpayer dollars, Lee says African Americans need to realize that staying home means their tax money is being spent on others – usually white visitors. “… And I think some of the strategies might be reaching out to local schools and inviting kids to parks as a field trip or a picnic place or other events so they can experience parks,” says Lee. The University of Missouri study did not sample African American patronage of other state or national parks such as Yellowstone National Park, Glacier National Park, or Great Smoky Mountains National Park. Still, Lee is confident that the pattern he and his colleagues uncovered in Cedar Hills, Texas prevails at those and other popular and iconic summer destinations as well.